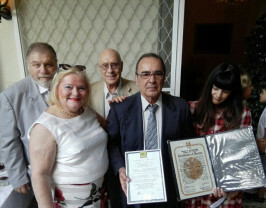 (L to R) Maurice and Beatrice Carasso, Moise Battino, Christos Lataniotis and daughter Mara. In a moving ceremony which took place on May 15, 2017 at the residence of the Israel Ambassador to Greece, HE Ms Irit Ben-Abba, the Greek couple Katina and Ioanis Perakis were posthumously recognized as Righteous among the Nations. Representing the family, Katina’s grandson, Mr. Christos Lataniotis and his daughter, Mara received the award. The Raoul Wallenberg Foundation, an educational NGO chaired by Eduardo Eurnekian, was represented by Maurice Carasso, a long-standing Jewish community leader from Thessaloniki and esteemed member of the RWF. The Perakis have saved the life of Mr. Moise Battino, who especially flew all the way from the USA, together with his sister, Esther Mallah, to attend the ceremony. Moise found refuge at the Perakis’s home in Piraeus, while Esther was taken in by Dimitra Dimopoulo, also recognized as Righteous among the Nations thanks to the RWF research. However, members of the Dimopoulou Family were not found. Nevertheless, an Israeli Embassy representative pointed out, that Dimitra Dimopoulou was honored and her name will be inscribed on the Wall of the Righteous at Yad Vashem. Moise Battino and Esther Mallah are two siblings who were hidden by two local Greek families during the German occupation in Greece in World War II. They told their story to the International Raoul Wallenberg Foundation, and for the first time to anyone outside of their immediate family. Moise Battino and Esther Mallah were interviewed by Mr. Zvi Kichel from the Raoul Wallenberg Foundation. The Foundation found their story relevant and is preparing a file to be conveyed to Yad Vashem Department of Righteous among the Nations (Jerusalem), to have their saviors awarded the title of Righteous.